If this was a 10,000 metres race, we would be hearing the bell. If it was a Gala Performance we would have just completed the final rehearsal and be awaiting the Opening Night. If it was a mission to the Moon we would be strapping ourselves into the lunar module. Note how the hyperbole grows. 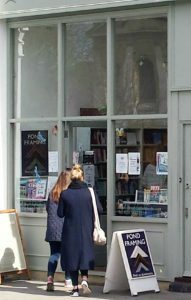 This is but a little local literary festival, yet there is tension in the air. The audience numbers are less than I, for one, expected, but the Arts Centre people, whose ticketing service we are using for all three venues, say that that’s normal. They sell most tickets in the week of an event, not weeks in advance and most of the audience is local, preferring to call in and buy tickets in person rather than incur buying fees for multiple ticket purchases on-line. So it’s a case of holding our nerve and pressing on, believing that the numbers will go up. I know that, for the launch of ‘Reconquista‘ at Clapham Books next Saturday evening, there will be a good-sized crowd, as I have, personally provided tickets for at least two dozen and there are other sales too. The maximum is 40. I was growing concerned at recent temperature levels, given that this will take place outside in the garden. But the long range forecast shows a marked increase in temperatures towards the end of the week and a likely high of 20 degrees next Saturday. That’s okay. It’s also likely to be sunny. Even better. There will garden lights and a marquee, sherry, wine, tapas and music. All will be well and all manner of things will be well. Final organisational issues are being resolved. In the theatre we want a lecturn for the Readers Afternoon event, so that each writer can read a piece from their opus. 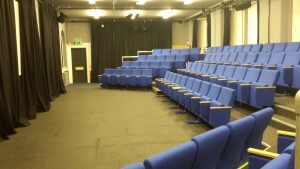 Yes, there will have to be a lighting technician working the lighting board at the back of the theatre, even for the discussion events, because many of them will involve questions from the audience and the house lights will be needed for that part of the session. Where will the panellists enter? Where will the authors sit after each session to sign their books ( sufficiently far away from the point at which the books are being sold, since you ask, so as to avoid a bottleneck as people ask for inscriptions/dedications ). 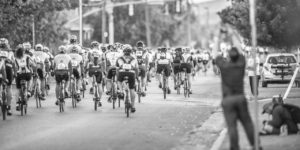 Have we really left sufficient turn-around time between events? Yes, though Friday night might be a bit tight. What about the signage from venue to venue? What about the ‘footprints’ on the pavement? Why wasn’t there publicity at the weekly market in Clapham Old Town this morning ( there was, eventually, because I went and got a pile of flyers which the market traders were happy to stick up and hand out ). Who is doing the rush-hour leafletting at the three Clapham tube stations? ‘Calma,’ as my Spanish neighbour would say. It’ll be alright. And I can’t believe that it’s really happening. All from a brief conversation and a proposal last August when I went to Omnibus to speak with Marie ( and blogged about it afterwards, not really believing that it would happen ). Famous authors, professional festival organisers, Youtube trailers and now it’s here. Phew. 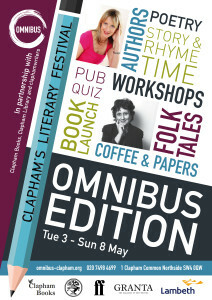 ‘Omnibus Edition’, Clapham’s Literary Festival starts on Tuesday. This entry was posted in London and tagged London, Writing & publishing by juliej. Bookmark the permalink.